Not only does Mozilla have a new default search partner for Firefox, the open source browser is getting a snazzy new search experience to boot. Mozilla calls the new experience a “one-click search” that allows you to type in a search term and then quickly specify which site you’d like to search using that term. Earlier in November, Mozilla tipped that a “new, enhanced” search experience was coming when the Firefox maker announced its new partnership with Yahoo. Yahoo is set to become the new default search provider in December. Mozilla did not say when the new search experience would roll out, but presumably it will happen next month. 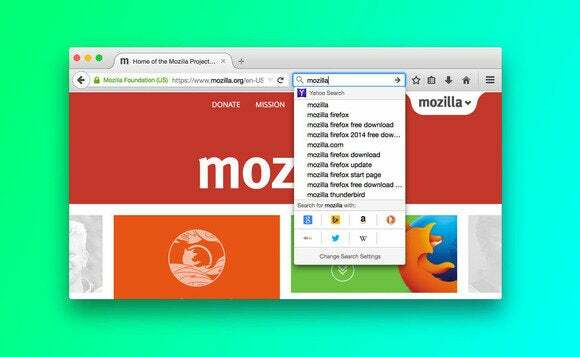 The story behind the story: The bulk of Mozilla’s funding comes from its search partnership. With Google’s plans for Chrome getting ever more aggressive, it hasn’t made sense for some time for Mozilla to rely so heavily on a competitor. But Google is by far the best search engine around. Moving to Yahoo will take some getting used to for Firefox users—especially the masses who don’t bother to change their default settings. It seems Mozilla hopes to make the Yahoo switch more palatable by creating a new experience that de-emphasizes the importance of Yahoo as the default search brand. Currently, when you search on Google in Firefox, you get a list of auto-complete suggestions similar to what you see at Google.com. Under the new search experience, you’ll still see the auto-complete suggestions with Yahoo. Below that, however, will be a grid of icons for various other sites including Amazon, Bing, Duck Duck Go, Ebay, Google, Twitter, and Wikipedia (see the image at the top of this post). You'll also be able to add search engines of your choosing to the one-click menu when it goes live, such as Yelp or Dictionary.com. 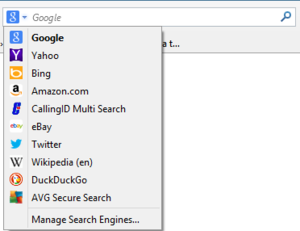 The current way to switch between search providers in Firefox. Those defaults, however, are the same search alternatives Firefox offers now. The only difference is that instead of hiding them under the drop-down menu, they’ll appear at the bottom of the search suggestions. The idea is that you’ll be able to type in a search term and then get automatically directed to a search or specific result on a given site. 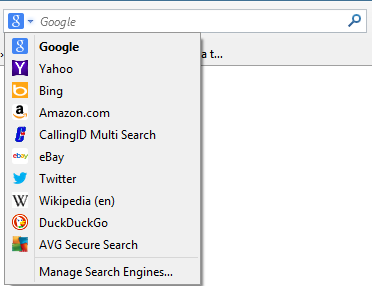 You can do the same thing now by clicking the drop down search menu in Firefox and switching search providers. But every time you switch using the drop-down menu in the current version of Firefox, you have to manually switch back to your default when you're done. The new one-click set-up will eliminate that issue making the process more convenient and possibly a more popular way to use Firefox’s search function.